For those who watched the film on Gettsyburg on saw Jeff Daniels portray Colonel Chamberlain of Maine who saved the battle by holding the line. He was a Professor of Rhetoric at Boudin College. Most people today don’t even know what rhetoric is. They think it is a term for politicians blasting each other. In truth, rhetoric was teaching people to think logically, precisely, and intelligently, and to write and debate each other in the same way. We have lost our skills of rhetoric in this meme driven social media opinion forming society where everyone accepts things that confirm their world view and rejects those opinions they disagree with. I really wish everyone was taught rhetoric and cynicism at a young age. 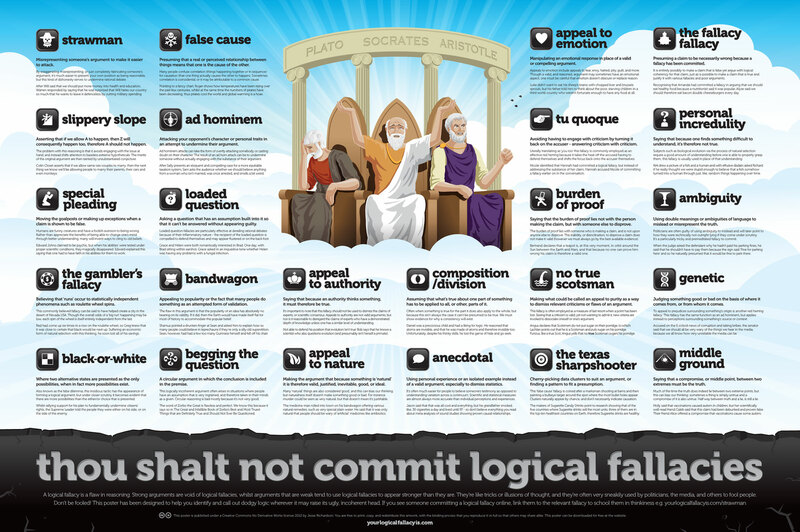 Luckily, I was taught debate and rhetoric as a child and learned what “logical fallacies” are. They are types of arguments that are not really valid from an intellectual standpoint but are often made. For instance, a proponent of global warming caused by mankind my use the logical fallacy Appeal to Authority – “All scientists accept this as fact and you are no scientist.” For one, they have no way to know that. Second, even if true, it does not mean they are right. All scientists once believed the Earth was the center of the universe. An appeal to authority is a bad argument. Another is a loaded question, such as “Do you disagree with the President because he is black or because you don’t care?” Your two choices are racism or indifference. The same as, “Do you still beat your wife?” Learning rhetoric allows you to make cogent arguments from an intellectually sound basis. WARNING: Those who do not know rhetoric may react by getting angry and calling you names. The above poster is available at the link below. You can also zoom in there to see it better. Principles of training communicators. It may entail the study of principles and rules of composition formulated by critics of ancient times, and it can also involve the study of writing or speaking as a means of communication or persuasion. Classical rhetoric probably developed along with democracy in Syracuse (Sicily) in the 5th century BC, when dispossessed landowners argued claims before their fellow citizens. Shrewd speakers sought help from teachers of oratory, called rhetors. This use of language was of interest to philosophers such as Plato and Aristotle because the oratorical arguments called into question the relationships among language, truth, and morality. The Romans recognized separate aspects of the process of composing speeches, a compartmentalization that grew more pronounced with time. Renaissance scholars and poets studied rhetoric closely, and it was a central concern of humanism. In all times and places where rhetoric has been significant, listening and reading and speaking and writing have been the critical skills necessary for effective communication.